Greetings and salutations everyone; yes, once again it is I, Mani the long-suffering purebred border collie, filling in for the guy I live with, and here to bring you the latest news from our garden. You may remember me from such posts as “In The Doghouse”, among an increasingly large number of others. Here I am in a highly uncharacteristic pose. I’m back from the Bad Place, and I have this thing around me. We’re not going to discuss why this happened, but it did, and I’m not very happy about it. I had “a procedure”. The guy I live with isn’t really happy, either, and so I guess that makes it slightly better. He says he doesn’t like seeing me having to wear this stupid cone. If you think I don’t look so pathetic, try this picture. The guy I live with did say that he wanted me as a friend for the rest of my life, and how super important I was to him, so I wouldn’t run away and bad things would happen, but the cone isn’t very nice at all. I think I also look like an idiot. I don’t get to go on walks or to day care until the first of July, which I guess is about four thousand days from now, so the guy I live with better be extra nice to me from now on. It’s supposed to get hot and dry (“finally”) in the next couple of days, and I know I won’t like that, so we’ll just see how nice he is to me then. Meanwhile, I suppose it’s true that things go on even when I’m not here, and so I have some pictures. 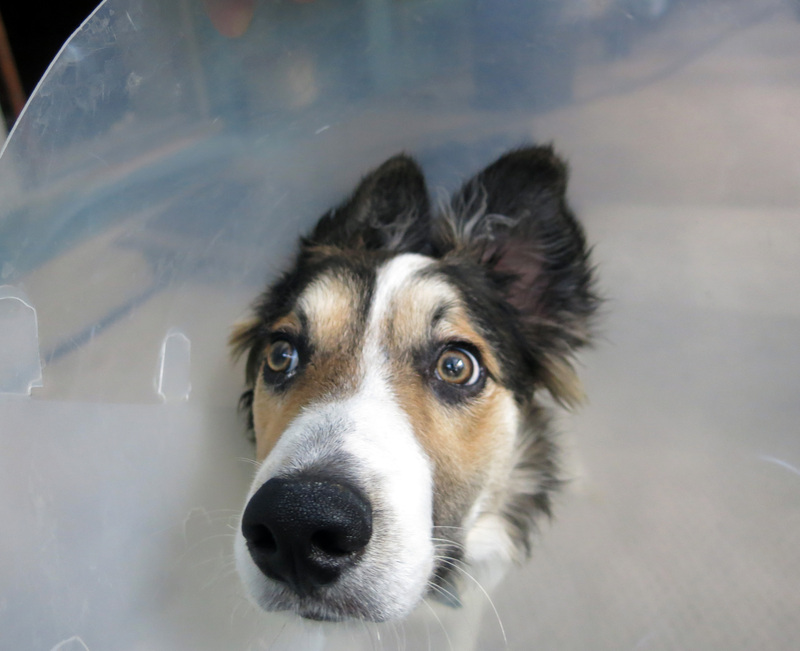 I’m mostly interested in me, and my stupid cone, but I’ll show the pictures anyway. 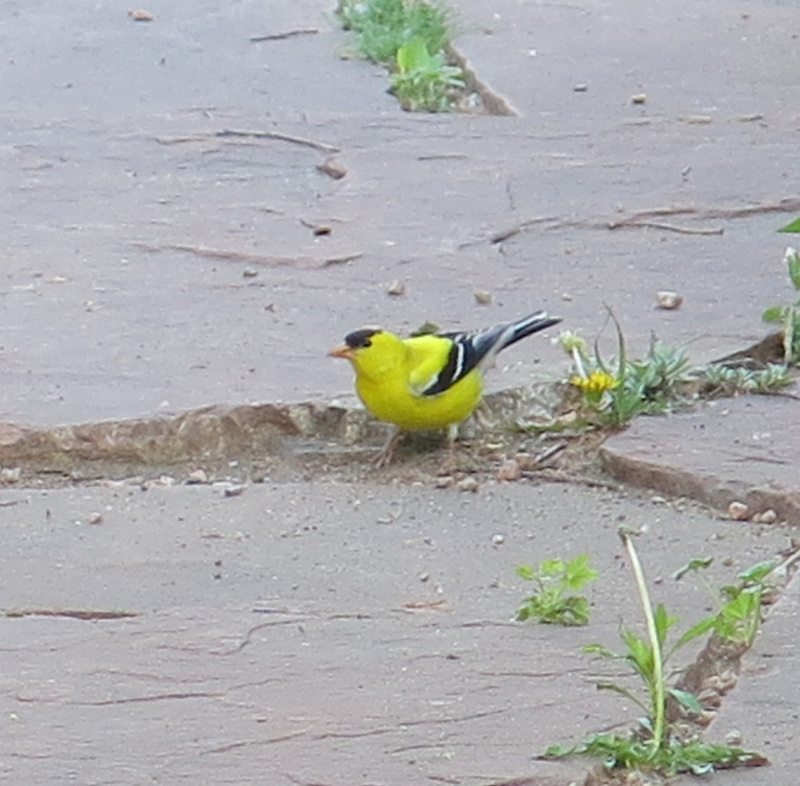 The guy I live with says that the goldfinches are back. I think this is what he means. There’s lots of stuff in flower now, though of course it’s hard to appreciate it all when you have a cone on your head. 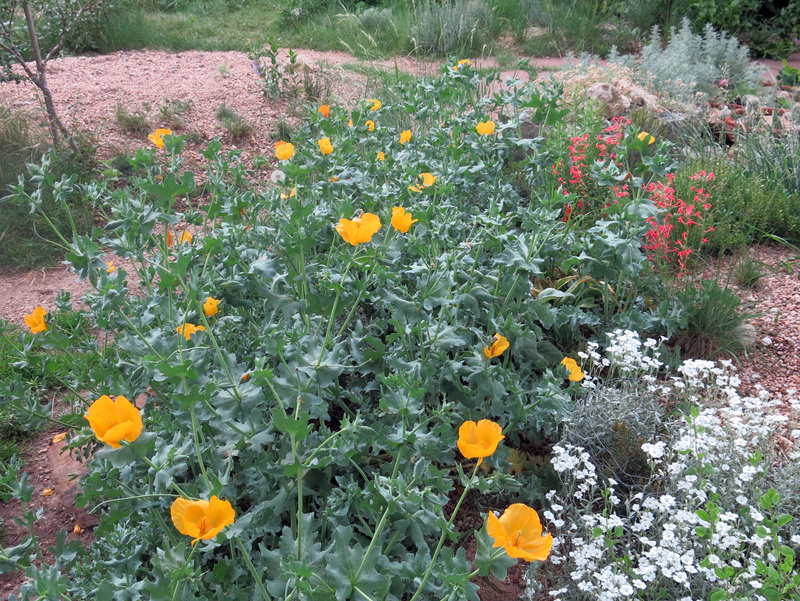 The flowers are the horned poppy (Glaucium flavum), Gilia (or Ipomopsis) aggregata, the red, and snow-in-summer. The buddleia (Buddleia alternifolia ‘Argentea’) is doing pretty well. You can smell it all over the garden, even if you have a cone on your head. 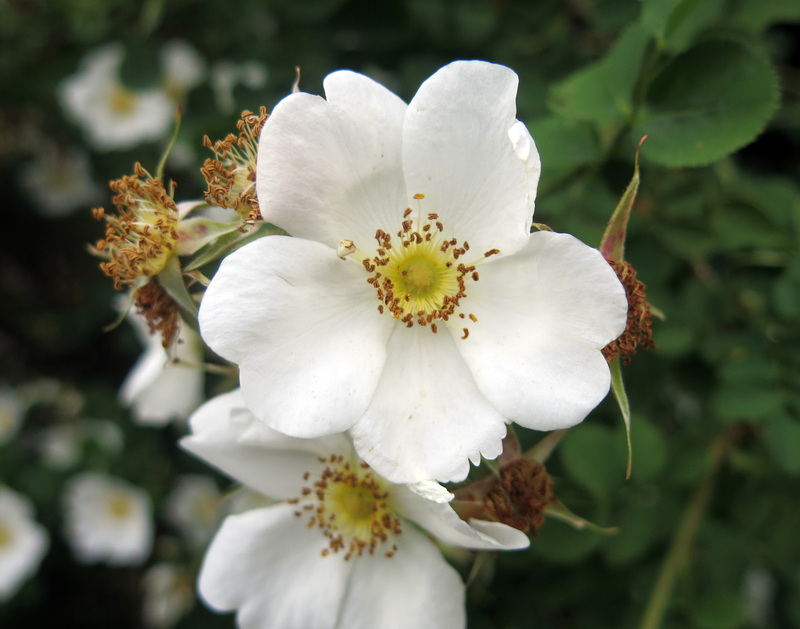 The other thing that’s smelling up the garden is the big rose, Rosa kokanica. 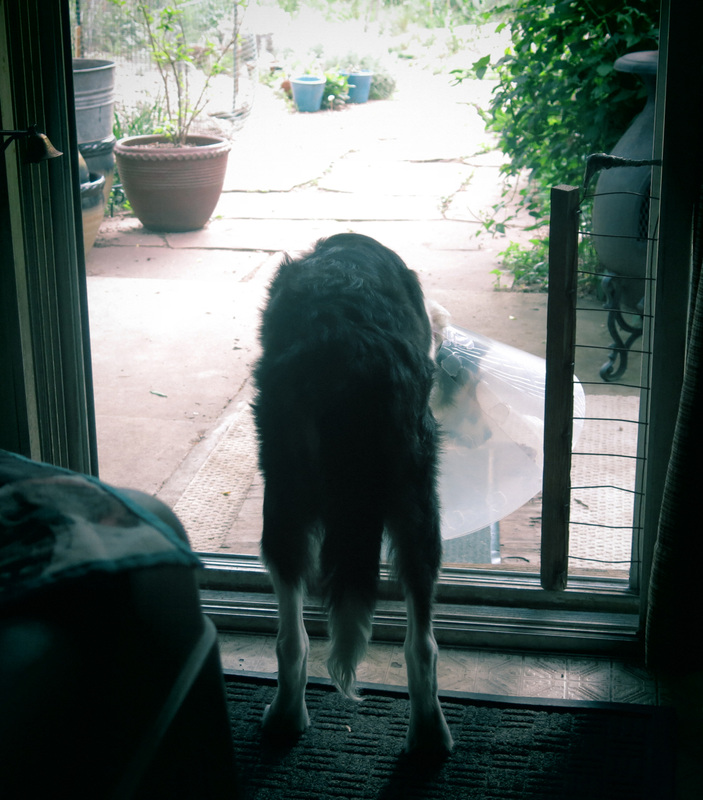 It fell over the path that I walk on, and the guy I live with had to prop it up, which is good, because, you know, I have a stupid cone on my head, and might run into things. The guy I live with said he mowed the back lawn while I was away today. It’s not a very big lawn, but it’s good enough for me, and it’s private. That’s right, I have a “private lawn”. (And a cone stuck on my head, of course.) There are some cactuses flowering. 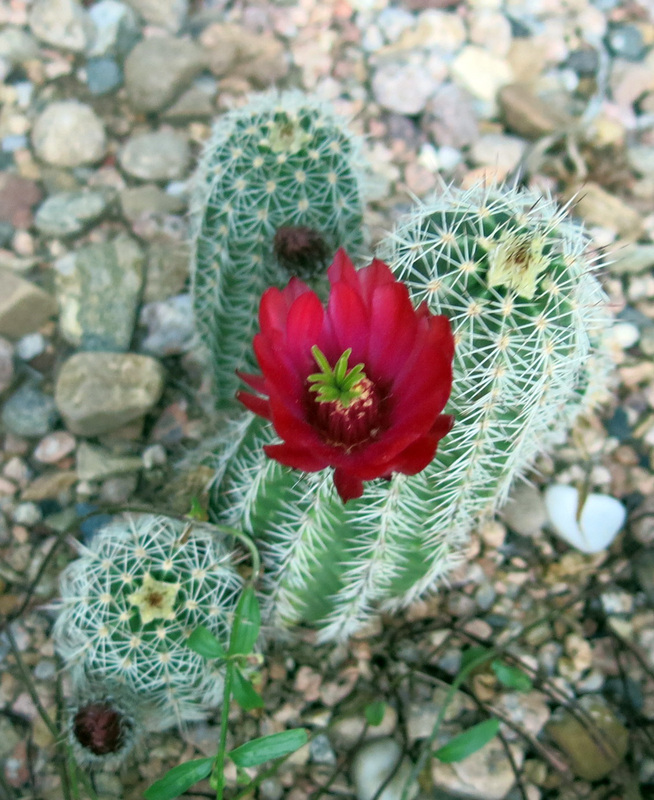 I’m not sure why I’m even saying this, because here are some pictures of cactuses in flower, so I guess you could tell without me saying anything, but when you have a cone on your head, you don’t think so clearly. You know what gets cactuses to flower? Rain, that’s what. And it’s been raining here almost constantly. 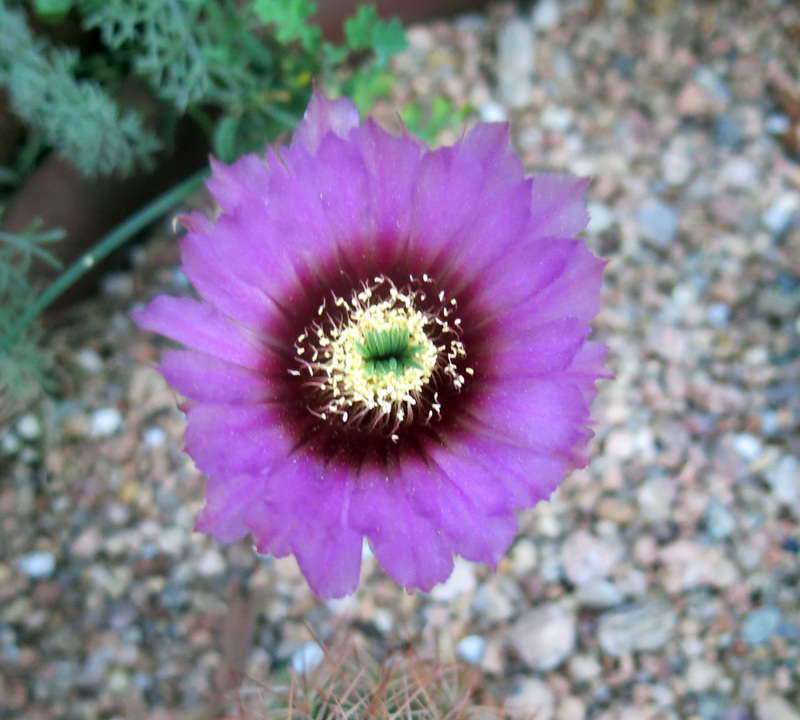 Believe it or not, in that last cactus flower picture, those aren’t weeds around it, but a skullcap. Scutellaria angustifolia. 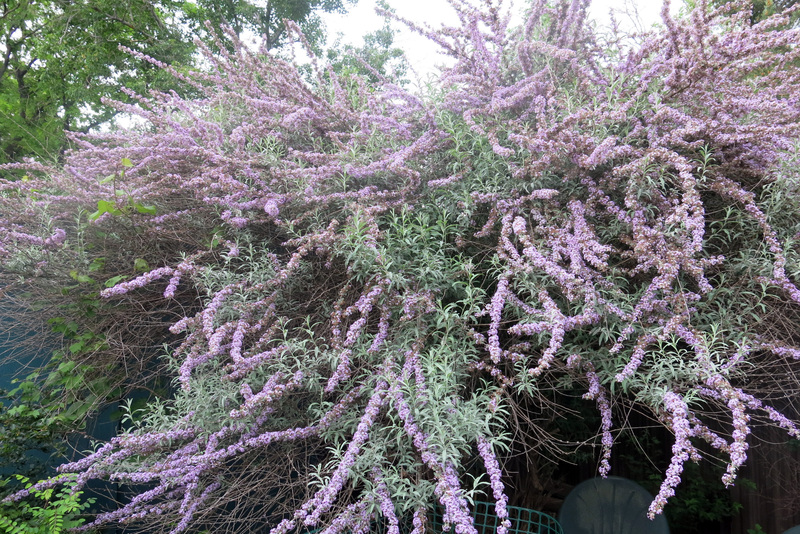 It has blue-purple flowers, and then disappears for the summer. I guess that’s all. I mean unless you want me to go on more about the cone on my head. The guy I live with says maybe not to, so I guess I’ll let you go. Pathetically, of course. This entry was posted in Uncategorized and tagged Buddleia alternifolia Argentea, Glaucium flavum, Rosa kokanica. Bookmark the permalink. Thanks; I guess I have to wear this thing for a while. Sigh. It is crappy to have to wear that cone Mani, but it must be for your own good. just ask the guy you live with to show you some pictures of Queen Elizabeth the 1st. She wore some similar get-ups and she was the ruler of an empire. As are you. Thanks; I feel more like a complete idiot than the Queen of England. The guy I live with says he bets Queen Elizabeth didn’t have as wide a variety of chew toys to play with, including two Lamb Chops and a Bedtime Giraffe, and so not to mope so much. it’ll all be okay. just hang in there, Mani. Thanks; that’s what the guy I live with says. He says that time goes by so fast, this stupid cone will be a thing of the past before I know it. I kind of doubt it. 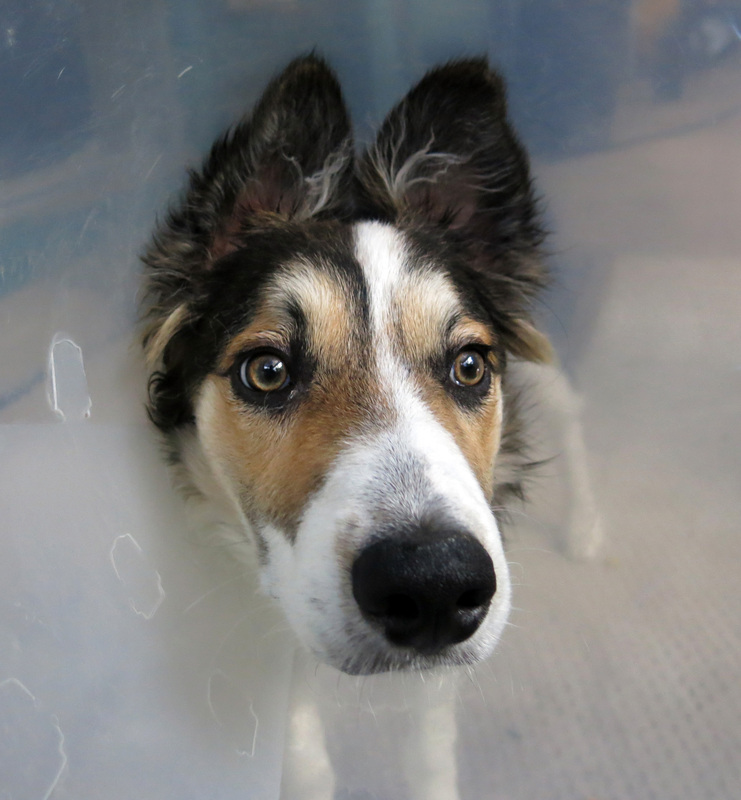 Oh Mani, you must have had an extra big procedure to warrant such a big cone and such a long stay away from walks and friends. Did you know there are puffy inflatable cone things that bang around less? Our girls had the old fashioned kind and one of them, the extra piggy one, learned very quickly how to roll her food up into it and toss it back into her mouth. Did you back up to try to get away from it? 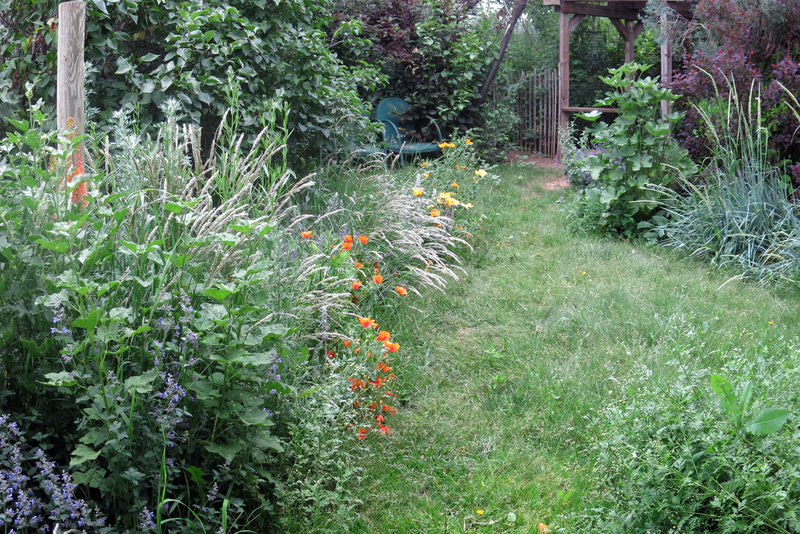 Well I hope your beautiful garden is some consolation for other things that are lost. But we’ll say no more about it except this too, shall pass. Thanks; a puffy inflatable one doesn’t sound so bad, especially if I can bite into it and make it make a whistling sound. We weren’t even going to talk about this at all, but then, I would have been out of sight for almost two weeks, and people might wonder. Yes, we might wonder about the Mani whereabouts if you vanished, so thanks for posting even in this, your trying hour. or days. or weeks. whatever. ANYway, those who wear the cone should take every opportunity to vent. You vent with a certain *voice*, Mani. In fact, you sound highly annoyed, as who wouldn’t be in like circumstance. Your manor is so beautiful right now, filled with wonderful, colorful, transient flowers, even rain-induced cacti flowers, and here you are wandering around with such a *restricted* view. 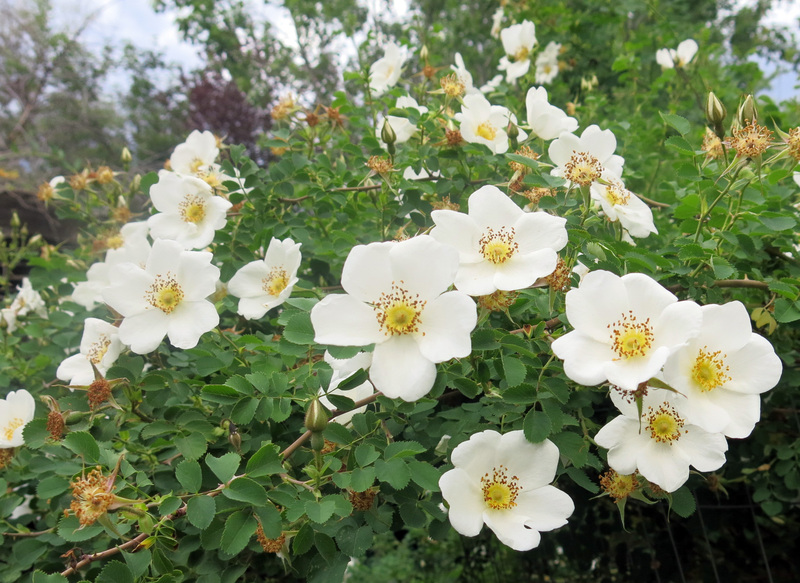 Enjoy the scent of rosa kokanica — such a fab photo, and I know for a fact how difficult white is to photograph without its flaring out. The guy you live with captures well the beauty of the rose close up. Back to the subject at hand (or neck), the cone: I believe the final shot conveys your disgust fully, and from the best angle too. Perhaps time has come for the guy to bestow that treat which your readers have mentioned so often. Tell your buddy to break out the brie, Mani. It’s treat time. Thanks, though I’m not allowed to eat anything until tomorrow, if you can believe that. The rose is covered with bees; you can even hear them (the cone of course magnifies every sound). It’s a really big shrub and has been here for ages, he says. It was grown from seed. In a few weeks, or less, the plants of ‘Darlow’s Enigma’ will be flowering, and then the little garden by the shed, which was called “the enclosure”, though it’s not enclosed now (there’s a new fence under construction) will be full of scent. I don’t like my cone at all, if you didn’t know. Not even slightly. I sympathise totally as I have had this once and a novagard twice. This is just a quickie to say to get your guy to look at the website below. I think I looked a lot cooler in this and I could go in and out my doggie door no probs. Though it will probably never be required again it is wotrth looking into. Thanks. I looked at those, and they do look a lot cooler, but I would still look like an idiot. The guy I live with often feels like an idiot, so I guess we’re well matched, huh. Mani, my friend, you have to find a way to make this work for you. When I was a conehead, I figured out how to use the edge to dig in the yard. That was really fun because you can scoop up lots of dirt after you loosen it with your paws. And the cone works like a receiver, focusing all the sounds and smells right to your working parts. I’m sure you already have superior sensory abilities, but this will just make them even better! It’s clear you know the last benefit of the cone. It makes the people you live with feel really guilty, so you get extra treats and you can do things that might get you scolded on another day! Use it, my friend, until you lose it! Thanks; I guess that makes me feel better. My activity is restricted, though, and so I have to be on the leash when I’m outside, which is really no fun at all. I think the guy I live with’s Guilt Level is at about 9.5 right now, on a scale of 10. But you know what? He knows stuff. I thought he was just this guy, who made me do things I didn’t want to do, and also let me do things I did want to do, like go on walks, but he knows stuff. Like how to make it so I can get to my breakfast with this stupid cone on my head. He rigged something up. I notice that he stares off into space when I give him The Look, too, so he must understand that, which is kind of surprising. ah, mani, so sorry you have to wear that stupid cone. we (mushy the cat and me) still love you, and look forward to it coming off! patience is hard. Thanks. Patience is really, really overrated. I did make the guy I live with get up at six o’clock this morning (he was thinking more like eight), and I already know that he’s not a morning person. I figure if I have to have this stupid cone on my head, then we’re going to get up when I feel like it, and not when he does. Mani, you are one beautiful dog. Thanks. I think so even with the stupid cone on my head. Sorry you both have to go through this. Thanks for writing such a humorous post anyway and with such gorgeous plant photos. Thanks; it isn’t so much fun, but then, it isn’t so bad, either.